If you're looking for Ranch Style House plans, I wrote this page to help you decide whether or not this house plan style is right for you. So to set the scene we’ll go over some of the common features of the Ranch Style, then we’ll go on to discuss factors to consider if you’re thinking about going for this style. With a name like Ranch Style House Plans you’d think these homes are designed for cattle country when in fact they are designed for suburbia. Here’s the features that you’ll find in ranch style houses. Generally a simple rectangle or L-shape. Sometimes a U shape. Open floor plans with few walls and an efficient use of space. Rectilinear walls (no walls angled at 45 degrees to the facade of the house). Sliding glass doors opening onto a patio. Exteriors can be varied, brick, stucco or wood. Is a Ranch style house plan suitable for your home? Here’s some points to consider to decide if a Ranch style home plan is for you. Flexibility – The philosophy of the ranch style (one story, open plan living built in a simple shape) means that a variety of floor plan arrangements are available. Lot Shape – Ranch house plans generally have a two room depth in each rectangular part of the floor plan. This means that the main rooms usually have a view either to the front or the rear of the property and perhaps to the side as well. If the lot is narrow you’ll need to think about the view into and out of the side windows. This can be solved using translucent glass or clerestories (windows higher up). Of course if you have a generous lot with generous space on all four sides of the home then all the better. Sloping Site – Ranch house plans sit best on reasonably flat sites. If the site is sloping slightly the best solution, to keep to the style, is a peeping basement rather than a change in height of roof line. Scalability – Ranch and Rambler plans on the market range from 1,200 to 3,000sqft. I did spot one of 5,500 sqft but I’d have put that in the prairie category. Expansion Potential – The roof doesn’t give any scope for future expansion because of its shallow pitch but there’s always the basement – although this would typically all be below grade in a Ranch style house. So an addition is the best bet here. An addition to make a rectangle shaped house into an L-shaped house, or extending the L on an L shaped house, or making an L shaped house into a U-shape would be the best option for more living space. Cost of Construction – The simple shape (straight walls, no nonsense roofs) of ranch homes makes them one of the most affordable house styles in price per square foot terms. The ranch style is America’s very own architecture also known as the Rambler style. The majority of these houses were built in the post-war era starting out west. Pretty soon the style could be found all over the country. After the war in California there was lots of land available for building and lots of people that needed a house. The houses needed to be built quickly which led to the simple design. The post war period ushered in the age of the car so original Ranch style houses were often designed with an attached garage. 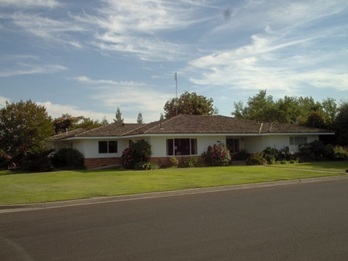 Here's a 1966 ranch style house in California. Just as a bit of an aside I think you might like Rancho Style. It's a website dedicated to Cliff May – probably the most prominent ranch style house plan architect. It’s set up by a real estate guy who obviously loves this type of house.